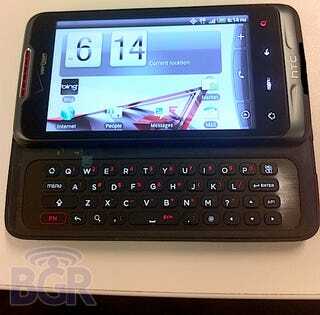 Last we heard of the Verizon ADR6325 phone model-number, it was thought to be the 10MP HTC Merge. Whether this 5MP one BGR has spotted is the same or not is anyone's guess—but doesn't it look great? Supposedly running Froyo, this unknown Verizon phone doesn't feature the same Quick Keys as the G2 and Desire Z, but does have the same four-row keyboard, with the numbers doubling up on the top line of keys. It looks to be one of Verizon's Bing-equipped phones too, but don't hold that against it.